Here is another oddball release out of Italy. 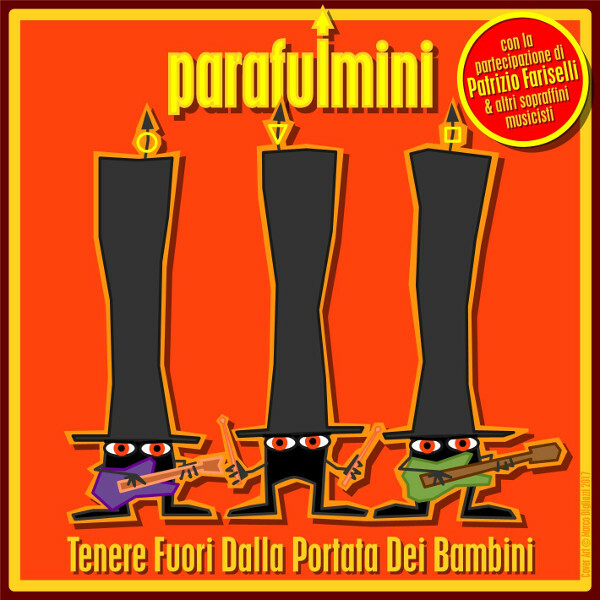 Parafulmini, Italian for lightning rods, has just released Tenere Fuori dalla Portata dei Bambini (Keep Out of the Reach of Children), a set of 17 rough cut instrumental tracks clocking in at 51 minutes. Some are grouped into suites, such as “Parafulmini Suite,” “Idraulici in Vacanza,” and “Una Settimana di Bontà.” But all tracks are connected by a silly sci-fi story: Parrucchieri all”Ultraspazio (Hairdressers from Outer Space). Parafulmini calls their music Prurf, a combination of surf and progressive rock, along with a range of music in between. The trio Marco Bigliazzi (drums), Riccarso Zini (bass and baritone sax), and Filippo Brilli (saxes and guitar) run through these tracks at first blush, as a garage band. But the closer you listen you begin to glean that there is something sophisticated going on here. Riccardo is an outstanding bass guitarist who propels the music. What may start out sounding like surf rock, for example “T’arraffo e T’aruffo” morphs into a dissonant jam. Other tracks stray off into jazz fusion territory along with time signature changes. Then there is “Idraulici in Vacanza - Acqua a Pedale” that begins with liquid sounds and a rapid guitar riff and morphs into straight ahead I-VI-V-I garage surf rock, to be followed by “Idraulici in Vacanza - Pedale ad Acqua” with synths that take the listener into jazz fusion. The title track goes in an entirely different direction and closes with the only vocals, the opening lyric from Mama Cass’ ”Dream a Little Dream of Me.” This is a fun album, with the cover art making me think of Pink Panther animation.